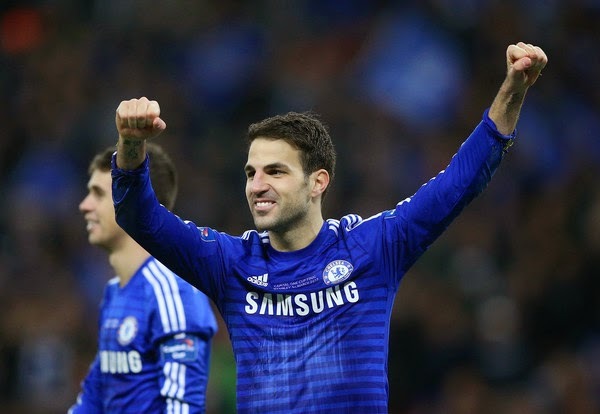 Fabregas gave it seven - How would you rate Chelsea's season? Cesc Fabregas has rated Chelsea's season this term a SEVEN out of TEN! I am wondered if you were asked the same question, what rating would you give us? Now, before you give your opinion or at least think about it, I want you all to think back 12 months to where we were, to where we are now and then give your ratings. Although we did much better in the Champions League last season, we finished third in the Premier League and were knocked out of both cup competitions. We defined our season as being two or three players short of challenging for honours despite throwing the Premier League away! Now look at us. We have emulated Jose Mourinho's first season as manager (and we all know what happened after that point!) having been only defeated in the league twice, sat at the top of the table for the whole season. We have won the League Cup again to add another piece of silverware to our growing mantle piece but have had the disappointment of being knocked out of the FA Cup by Bradford and knocked out of the Champions League by PSG. If you were asked before the season started and having seen the signings that the manager made, if you were to win only ONE trophy this season, what would it be? I would have said the Premier League all day long bearing in mind we had gone FOUR years without winning it. Anything else would have been a bonus but for me it was the League. I see this season as a success based on this time twelve months ago. We have taken a massive step forward and delivered two pieces of silverware with the League being the most important. I rate our season as 8.5 out of 10. What rating would you give it?